The Sao Paulo Trumpet Academy (SPTA) is a trumpet camp focused on jazz and classical music that aims to promote the exchange between American university professors and Brazilian trumpet students. Founded in 2017, the SPTA is organized in São Paulo, Brazil by the ITG Chapter São Paulo Trumpet Guild. 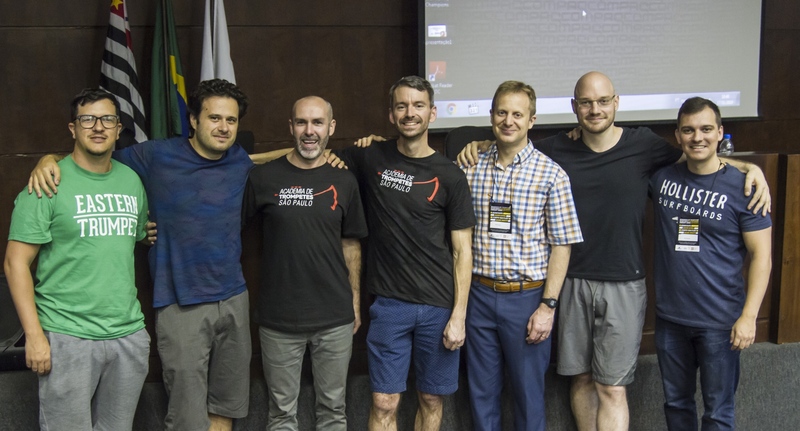 The SPTA organizers are Otávio Nestares, Bruno Garcia Fermiano, Felippe Freire, and Marcos Braga. The National Trumpet Competition (USA) has announced quarter-finalists and semi-finalists for their 2019 edition of the competition. ITG has learned of the passing of the Dutch trumpet player Peter Masseurs. Center Stage Brass (CSB) visited Stephen F. Austin University in Nacogdoches, Texas on November 11, 2018. The day included CSB members, Michael Attaway, Vernon Richter, Megan Bailey, Jason Williams, Ruben Perez, Megan DeRubeis, Amanda Kana, Brett Wyatt, Jason Oliver, and Jung-Moo Lee.